Welcome to Best Thing We Ate This Week, where each week, we'll have a special guest or Thrillist staff member talk about a New York dish they recently tried and loved. This week, Emily Hyland (co-owner of Brooklyn pizza and burger favorites Emily and Emmy Squared) talks about her favorite on-the-go sandwich. Samesa in Williamsburg is a tiny little spot, better for takeout than anything else, which is great for me and my husband [and Emily/Emmy Squared co-owner] Matt after a busy day of running around at the restaurants. The best dish we had all week was the chicken shawarma. It's a simple sandwich, but it's done so right. 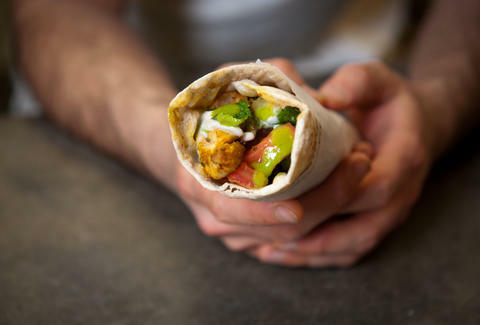 The chicken is incredibly tender and flavorful (Matt says it has a fresh but not under-spiced flavor) and comes wrapped in a house-made pita that is soft and warm. Definitely add on the green zhug for a touch of spice and tons of flavor. I also like to get the Brussels sprouts salad and then add the shredded sprouts into the shawarma for the ultimate sandwich-on-the-go perfection.